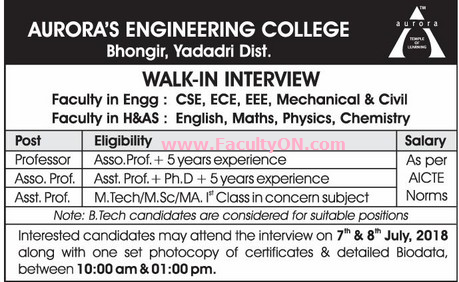 Aurora's Engineering College, Yadadri has advertised in the EENADU newspaper for recruitment of Professor / Associate Professor / Assistant Professor jobs vacancies. Interested and eligible job aspirants are requested to walk-in on 07th and 08th July 2018. Check out further more details below. About College: Aurora's Engineering College is the first engineering college established by Aurora Educational Society in the year 1998 with the aim to provide quality undergraduate and postgraduate engineering education in the state of Telangana. Equipped with the facilities of International Standard and the faculty with unshakable commitment to provide quality education, the college has been marching forward to set new standards in the field of engineering education. The college presently offers six courses under the B.Tech Programme, fifteen courses under the M.Tech programme, and MBA. How to Apply: Interested candidates are requested to attend the Walk-in interview by bringing their CV along with all originals & one set of copies of certificates and recent PP size photo to the walk-in address provided below.